My free lessons include 18 of the original mat exercises created by Joseph Pilates, and they are widely considered the most effective Pilates exercises. They do not require any equipment or a gym so you can do them anywhere and anytime. Do them during your work break. I travel extensively and do them in my hotel room and even airport terminals! My instructional technique is based on 40 years of teaching experience. It is safe and easy to follow even if you have no experience with Pilates or any exercise! Even if you consider yourself out-of-shape. If you have medical issues, I'll work with you and your doctor to insure a safe and effective workout. You won't find an easier way to learn Pilates. I've dedicated my Pilates career to removing all the confusing terms and unnecessary instruction so common in the Pilates world. Here you'll find Pilates instruction the way Joseph Pilates originally intended, simple and life-changing! These 18 exercises will give you all the marvelous benefits of Pilates including a unique combination of stretching, strength training, and even cardiovascular conditioning. And you can contact me anytime for free support, a service rarely found in online lessons. I am eager and delighted to help you master these exercises. This is all you need for a complete workout, but I hope you'll want to learn more mat exercises, and here's where my video ebooks come in. I offer 2 ebooks that contain additional instruction in a unique combination of video, text, and pictures. The Ultimate How-To Book of Pilates Mat Exercises teaches all 50 mat exercises including the original 34 exercises created by Joseph Pilates. These lessons are made safe for any age and fitness level, with step-by-step easy-to-follow instructions in text, video, and pictures to make it easy for any learning style. I lead you from a beginner's level to intermediate and on to the most advanced level of Pilates. And I am available for any support you need - your online personal trainer at no extra charge. 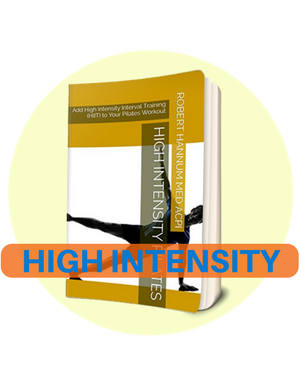 My second ebook, High-Intensity Pilates focuses on the advanced student, showing how to add HIIT to your Pilates mat workout. HIIT has been scientifically proven to provide the most exercise benefits in the shortest amount of time. HIIT and Pilates are a perfect combination for one of the most intense and effective workouts available today. Lesson 3 - 'The 100' Made Easy!